Gem in Nauset Heights. Walk to Nauset Beach. Beautifully furnished historic home in the Nauset Heights area of East Orleans. 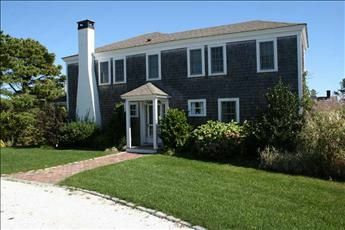 Walk to private Association beach or to Nauset Beach (public/lifeguards) on the Atlantic in minutes. Sliders from open dining room and living room to large screened porch overlooking expansive backyard. There is also a smaller porch off kitchen and a deck on the second floor. Home has 4 spacious bedrooms to accomodate large families. All the modern day conveniences you are used to at home including wireless internet. A very lovely place to be and convenient to the shops of East Orleans Village too! Have a larger group? Rent the Guest House too! Property ID # 7004183. With TV and DVD player. Large, private and great for games. Second floor balcony with ocean views. No pets. Ceiling fans; other fans.